Booking charge is € 4.00 per ticket. Journalists authorized by the Direction of the Museums after clearance from the “Sala Stampa della Santa Sede”, the Pontifical Council for Social Communications, the Foreign Press Association and the "Ordine Nazionale Italiano dei Giornalisti"
Access to the Museums is permitted only to visitors with proper attire! 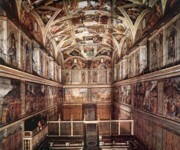 The admission ticket to the Sistine Chapel is valid only on the date of purchase. Tickets aren’t refundable. In the heart of the "Città Eterna" (Eternal city) and eternally busy city, you’ll find peace and blessing for the soul. The Vatican gardens are unknown to many tourists, wrongly. Because nowhere else, the interesting history of Rome is reflected like in the gardens of the Pope. Since the Renaissance, many important Popes as such as the Medici and the Borgia Popes, coined for the cultural face of their era. But the interest of the art-loving popes was not only of architecture, fine arts and music. Many immortalized themselves and their ideas also in the Vatican's magnificent gardens. For every garden lover, this is reason enough to visit Rome. Each time and every Pope coined the gardens and added individual changes. The first of the gardens was built on the mound Egidius in the 13th century. 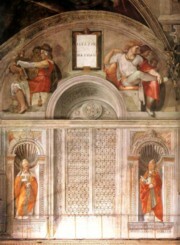 It was created for the pope's doctors and contained herbs and fruit. The first real garden plan was created under Nicholas V in 1450, but it has been implemented and modified and supplemented by other popes. Because Pope Innocent VIII let built between let build the Villa Belvedere on the site between 1484 and 1492, unfortunately the garden didn’t survive. The Vatican gardens are a treasure trove of botanical rarities, biblical symbol of plants and picturesque tree specimens. Around the buildings, in the Campo Santo, in the Rose Garden, in stone walls and in any other part of the garden, you’ll find plants of particular significance or beauty. These include plants from all areas: Flowering trees such as the evergreen magnolia, fragrant climbing plants like the jasmine and many others. After the visit of the gardens you’ll go to see the Sistine Chapel (Cappella Sistina). The Chapel is located on the east side of St. Peter’s Basilica and now belongs to the Vatican Museums. She was built from 1475 to 1483 as a chapel for Pope Sixtus from who she received also her name. The architects of this famous chapel were Giovannino de Dolci and Baccio Pontelli. With a length of 40,5 meters and a width of 13.2 meters, the chapel should have the same dimensions as the legendary Temple of King Solomon. 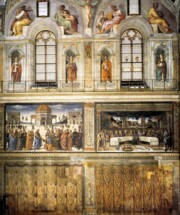 But the Sistine Chapel is especially famous because of its frescoes. The paintings on the wall sides show scenes from the Old and New Testaments. On the altar wall is the famous “Last Judgement” and on the ceiling the "Creation of Adam" by Michelangelo. The Vatican Gardens can be visited only through guided tours.